Neuromodulators such as Botox and Dysport are toxins that have grown in popularity due to their ability to treat wrinkles and slow down wrinkle formation. Wrinkles can develop as a result of sun damage, genetics, dehydration and all those intense facial movements we make in the gym. When we move our face, the muscles under the skin cause the skin to fold. Over time this process leads to wrinkles that start as fine lines and then develop into deep lines. They tend to start in the forehead, frown lines, and around the eyes (crows feet). Botox injections is the cornerstone treatment to reduce the appearance of wrinkles. At Neinstein Plastic Surgery, we tailor botox injections to allow for patients to still show their expressions but reduce the ability of the muscles to move enough to cause wrinkles. Dr. Neinstein calls it “baby botox” or a “sprinkling of botox”. Instead of the large doses many patients are worried about, our approach is always conservative and aimed at natural beauty that everyone will notice but nobody should know you had any treatments done. Botox is injected into the skin above the muscles to slow down the ability of muscles to contract or fold. This is beneficial for cosmetic purposes due to the fact that if the skin above the muscles is not folded it is less likely to crack and develop wrinkles. In addition to the proactive benefits of neuromodulator injections, these treatments can also soften wrinkles that are already present. We apply a light numbing cream to the skin while we prepare the injection. 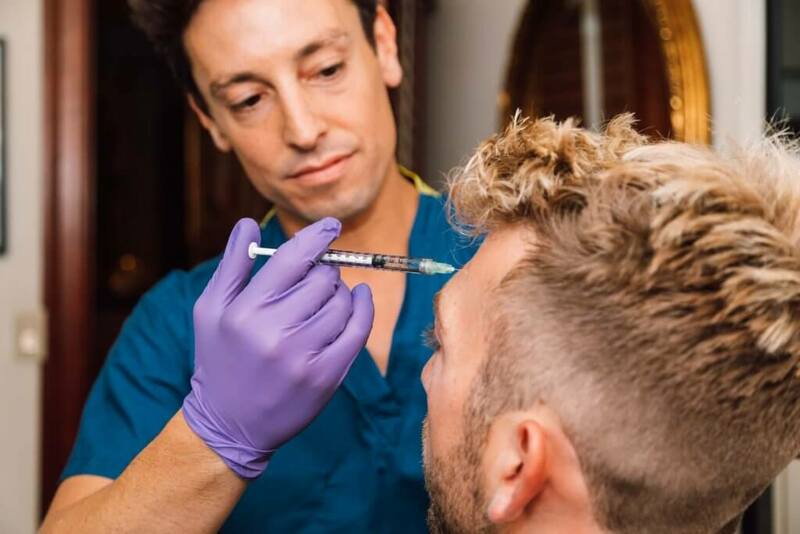 Dr. Neinstein then uses the smallest needles possible to lightly inject the clear fluid into the skin above the muscles in a pattern that is unique to your facial movements. He then applies Arnica anti-bruising gel, and that completes the procedure. Most people feel no discomfort during botox injections. After the procedure, some patients may notice little red dots where the injection was administered. These go away in about 20 minutes. It’s important to understand that the effect of the injection will not happen instantly; it can take anywhere from 4-7 days (depending on the individual) before you begin seeing results. When the effect does begin, you will not feel it turn on or even turn off, so you don’t have to worry that you suddenly have a ‘frozen” look. The effect comes in slowly and fades like a dimmer. Some people get a headache within the first day or two but this is totally normal and is just the muscles relaxing. The effect should last 3-4 months depending in your age, movements, and metabolism. We find that most patients will get treatments two or three times a year. We aim to responsibly price our Botox injections to ensure the procedure is within reach for everyone who seeks treatment. In our NYC office, the price of Botox treatments are approximately $300/ area of $15/unit. 3 areas (forehead, eyes, and frown lines are $700). If you have any questions, or are ready to schedule your appointment with Dr. Neinstein, please contact us at your convenience.